My name is Ramesh Kanneri, I studied with Pradeesh (S/o Prabhakaran, Pandompadath (H), Kalluvazhi, Palakkad, Kerala) from 5th to 10th standard, he was a bright student and good artist (drawing). His father is a daily labourer and mother home maker. He has one elder brother and had one elder sister. His sister was diagnosed with Chronic kidney disease and had to under go several dialysis. She passed away few years back due to renal failure. 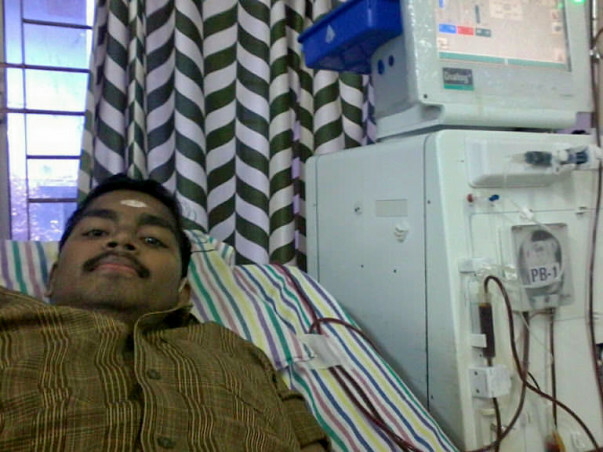 In 2009 Pradeesh was also diagnosed with systemic hypertension & chronic kidney disease. The only treatment is renal transplantation or lifelong hemo dialysis (twice weekly). He has been on dialysis since 2009. His parents have no money left to do the renal transplantation which is very costly. Along with this he has Hepatitis A infection. For the last seven years his family had to find approximately Rs. 2 lacs per annum for his dialysis and other medical expenses. For the last few years friends, relatives and neighbours have been helping his family to find this 2 lac rupees for the dialysis. His father was a daily labourer and now he cant go for his work because someone has to be with Pradeesh all the time (some times suddenly he may get an intense stomach pain or nausea). His elder brother is a contract labourer. They are doing their best they can to make him survive but if we can find a way to help him for at least one year it would be very good. The details of the treatment and the hospital records are attached for you. Kindly contribute to help save the life of this innocent 26 year old who has a long way to go in his life. Whatever you can donate will be welcomed and received with deep appreciation for your support.